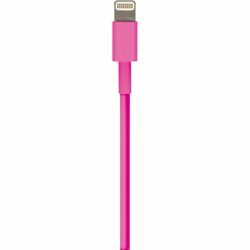 Enjoy fast data transfer and reliable charging with this Lightning® cable. Lightweight and flexible, it's easy to store and home or on the go! Made for: iPhone 5S, iPhone 5C, iPhones, iPad mini with Retina display, iPad Air, iPad mini, iPad (4th generation), iPod touch (5th generation), iPod nano (7th generation) Made for iPod, Made for iPhone, and Made for iPad mean that an electronic accessory has been designed to connect specifically to iPod, iPhone or iPad, respectively, and has been certified by the developer to meet Apple performance standards. Apple is not responsible for the operation of this device or its compliance with safety and regulatory standards. Please note that the use of the accessory with iPod, iPhone or iPad may affect wireless performance. iPad, iPhone, iPod classic, iPod nano and iPod touch are trademarks of Apple Inc., registered in the U.S. and other countries. This product is not licensed, designed endorsed or manufactured by Apple Inc.